Ever wonder why corrupt politicians work so hard to keep healthcare privatized under the ruse of “free choice, free market, less expensive?” Because those politicians are in the pockets of wealthy corporations that in turn greedily siphon off your tax investments and ultimately you and your family literally ‘pay the price’ by shelling out astronomical amounts for those very products (i.e., health insurance and medicines). And since those companies are businesses which are in it to make money as their top priority (and not take care of you and your family), they need people on the inside to stack the deck in their favor. In other words, thanks to backdoor deals in Washington, YOU’RE GETTING CHARGED WAY TOO MUCH for the medications and insurance you and your family needs. As a physician, I see what people pay for their prescriptions, and WHAT I SEE IS RAMPANT PRICE GOUGING. You may have heard that the drug maker Mylan jacked up the price on its EpiPen which is a prescription device that delivers lifesaving medicine to those with severe, life-threatening allergies. The price for the EpiPen went from $57 to over $1,300. One of my patients told me they paid over $1,300.00 for their son’s EpiPen. Or maybe you read about Turing Pharmaceuticals raising the price of the life-saving drug Daraprim from $13.50 to $750…an increase of more than 5,000%! This happens all the time. For example, to treat my diabetic patients, I sometimes prescribe Lantus® (a long acting insulin) made by the drug manufacturer SANOFI. Want to guess what one vial of the medicine costs (and by the way, one vial doesn’t last most diabetics even a month for their treatment needs)? If you get the drug through the Veterans Health Administration (VA) which is a government plan that HAS THE POWER TO NEGOTIATE DRUG PRICES, one month of Lantus cost $24. If you get that exact same prescription through a private insurance plan, expect to pay anywhere from $30- $245*. *The same insurance company changes it’s coverage for the same drug resulting in vastly different prices. Why? And if you’re uninsured and paying out of pocket? $280 to $400.00! We’re talking about an 1,100% price increase! And where is that money going? Straight into fat bonuses for drug company CEOs and executives, private jets, opulent buildings and fresh cut flowers that adorn the insides of those opulent structures. NOW…ARE YOU READY TO BE REALLY ANGRY? 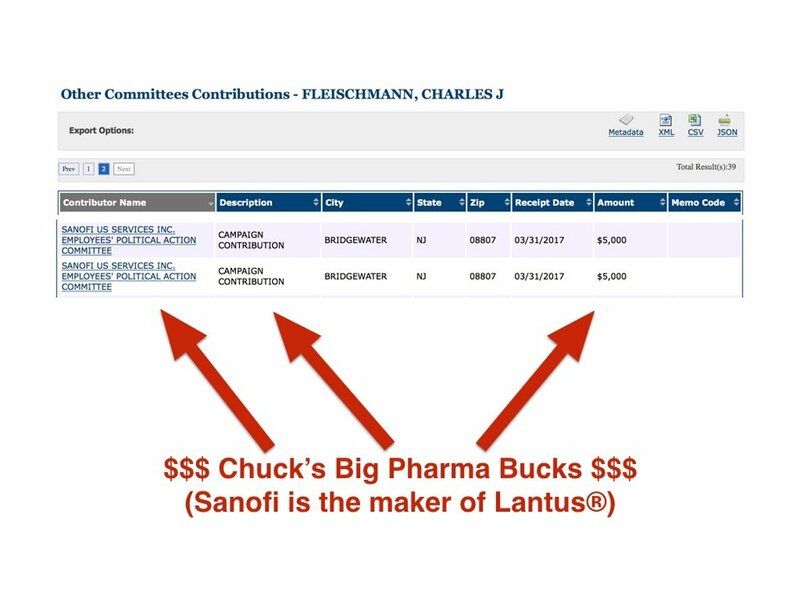 SANOFI Pharmaceuticals (the maker of Lantus®) is PAYING CHUCK FLEISCHMANN AND OTHER CORRUPT POLITICIANS TO KEEP THE PRICES OF YOU AND YOUR FAMILY’S PRESCRIPTIONS HIGH! Why can drug companies get away with this? Because thanks to CORRUPT politicians like Chuck Fleischmann, there are laws that prevent government programs like Medicare from ever being able to negotiate drug prices and these laws are not challenged nor removed by these corrupt politicians. The end result? More of your tax investment paid into Medicare is allowed to be siphoned off by greedy pharmaceutical companies while Chuck Fleischmann passively stands by and collects more campaign contributions from them. He is bought and paid for…period. And remember that 20 trillion dollar national debt? Guess which direction it keeps going? Since these laws do not affect the VA plans, and the VA still has the ability to negotiate costs, this difference in cost shows how devastating these laws AND CORRUPT POLITICIANS are on your pocketbook and your family’s well being. WHAT CAN YOU DO TO PROTECT YOUR FAMILY’S HEALTH AND FINANCES? Chuck Fleischmann is DIRECTLY RECEIVING CAMPAIGN CONTRIBUTIONS FROM COMPANIES THAT MAKE MONEY OFF YOUR BURDEN OF DISEASE AND MISFORTUNE. He is bought and paid for by these companies, protecting their profits and putting you and your family’s health in jeopardy. I support keeping the cost of medications and healthcare at affordable, fair, consistent levels and supporting a governing structure that will negotiate on your behalf and get you the best bang for your buck! If you would like to know more about why our government CAN NOT negotiate drug prices for Medicare please watch this informative video by clicking on this link.